I can’t answer. My broken wrist is acting up. places in the hands of the one man eg. Lincoln? Quite a triumph for him. 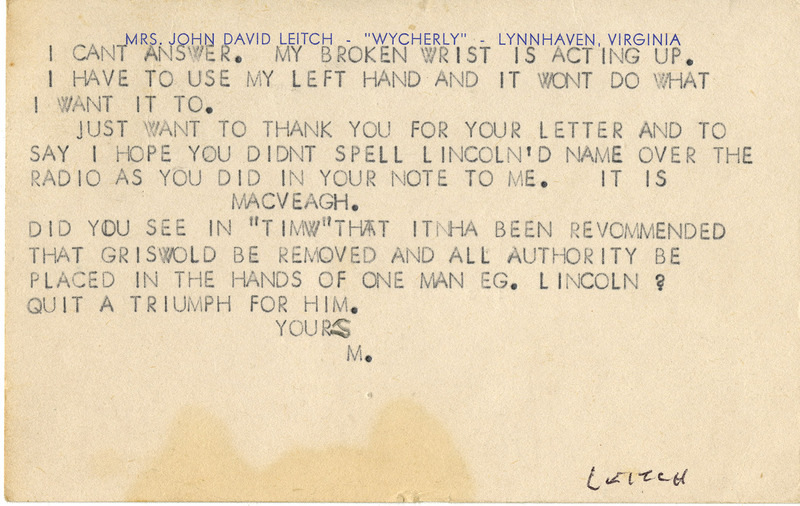 Leitch, Mary Sinton, 1876-1977, “Postcard, Mary Sinton Leitch to J. J. Lankes, November 21, 1947 (Ms2017-001),” VT Special Collections Online, accessed April 23, 2019, http://digitalsc.lib.vt.edu/Ms2017_001_LeitchMary_/Ms2017_001_LeitchMary_B1F7_LeitchtoLankes_1947_1121.